Hello there… I hope you truly connected to the story of the Wizard from last time. I really sense that this is a magical time in our world’s evolution, and that many of us are awakening to our supernatural selves – as Richard Burke predicted in his 1901 classic ‘Cosmic Consciousness’ and has been continually echoed in spiritual circles since. And now it’s time to temper the energy of the Wizard – with the wisdom of the Sage. For me, these two always seem to go together – Merlin has a truly deep understanding of his craft and of the implications of using power. Gandalf has the same true wisdom himself – and we find this in contrast to the younger wizards like Ged from ‘Wizard of Earthsea’ who recklessly endangered himself and the kingdom…or Thomas Covenant, who despite his power either denied it or abused it. The quote in the picture is from the student witch Tiffany Aching in “The Wee Free Men” who is discovering her power and how to walk through the world. And that’s the secret – to know yourself and so understand others. 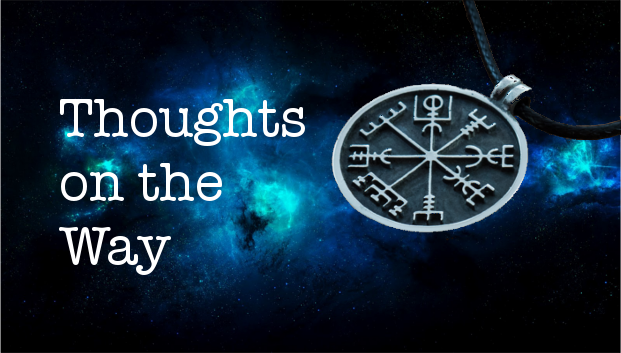 The witches that appear in Terry Pratchett’s DiscWorld series refer to this as ‘headology’ – that most of the magic they did was based on creating belief in the other person.. Does that mean that magic and miracles aren’t real? By no means! But what it does mean is that wisdom has power. Belief has power. What we understand, we command… even if we simply understand that we don’t understand it. Research into the human mind suggests that consciousness isn’t just seated in the brain itself – it’s actually spread out throughout the nervous system – every single nerve cell is part of our conscious experience. Others would say that our consciousness is actually part of the energy matrix that spreads beyond the boundaries of our physical being – our ‘aura’ if you like. And still others suggest that we are part of an infinitely huge interconnected consciousness – that we are in some mystical and magical way connected to everyone (and potentially everything) else – both those that are alive, but also those who have gone before us and even, maybe, those who will follow us. Is all that true? I have no way of knowing. But I find that holding it as a very real possibility helps me to explain some of the spookier things that happen to us. We are exhorted, often, not to seek power, but to seek wisdom. For if we have wisdom, then we will understand power – but power without wisdom is dangerous, untamed, wild, feral. The storybooks are full of cautionary tales of those who had their moment of access to power – and destroyed themselves with it. It seems that power held for power’s sake is guaranteed to rebound on the wielder. So the Sage is needed to ground the power of the Wizard, to allow that power to be used for good. And the Sage seems to be the place where all learning comes together – where everything that has been learned on the journey settles into one place, and everything comes together and has meaning. For me, I am finding that, having been on this crazy wild journey through my life, everything is coming together and starting to make sense where it didn’t on its own. At some level, the energy of the Sage is making its way into my life. And of course we find this as we become older – while much of our modern accent on ‘youth’ has sidelined the wisdom of those that are ‘not old, just older’ as Jon Bon Jovi put it, we know that age brings its new vantage point of wisdom. We would do well to listen to our elders… we know we have to take that wisdom and make it relevant to modern life rather than revel in ‘the good old days’ – but their understanding helps us to shape our lives with eternal wisdom. And of course, true wisdom comes from only one source – from Love. The Sage always seeks to bring Love, Joy and Peace – whether that is a wizened old man (or Yoda figure) or a beneficent monk. There is something special about being around these people – not that they have to tell you anything, but that their inner certainty brings a new level of understanding that ‘all will be well, and all manner of things shall be well’ as Julian of Norwich explained. We’re well into ‘The Return’ now. We’ve brought back the magical gift from the Journey, and we’re starting to integrate that into our normal lives. Or whatever passes for ‘normal’ now, because no matter how hard we might try to return to how things were, magic keeps popping up. We find ourselves called back to the journey, and we find that synchronicities and coincidences keep popping up for us. The adventure, having gripped us, will not let us go. So all that experience becomes part of us, part of our inner beings. Maybe we will be the gateway guardian for someone else about to embark on the journey. Perhaps our own quest will help someone else on theirs – or inspire them to step into it. We have words of encouragement and wisdom to show them at least the first few steps – knowing that, as we did, they will have to take much of that journey themselves. Yet this wisdom isn’t static. We’re not looking back on what was – we’re drawn toward creating better and more empowering futures for ourselves and for others – because once we have seen, we cannot ‘unsee’. We know that things can be better.. and so we find ourselves part of the sage council of the court – called upon by those who want to know… who want to experience a truly well lived life. The Sage seeks, ultimately, for truth. There is no point in empty words, in things that sound deeply wise yet ultimately lead us nowhere. The Sage needs always to be grounded in reality – the truth of everything, as we are constantly reminded in Hawai’ian Huna shamanism is ‘does it work?’ If it does, says the kahuna, then it is wisdom (literally, ‘it is Huna’). So everything the Sage knows – or thinks she knows – has to be submitted to this litmus test. ‘Does it work?’ This is a more powerful test than ‘does it make sense?’ – because as every truly wise being knows – some of the wisest things do not make sense sometimes. The Sage is voraciously curious, by the way. Everything fascinates him, continually asking ‘why is that?’…’how can that be?’…the Sage will continually be drawn aside by something that draws their attention, that poses a question or a challenge to their understanding. And of course, the Sage can hold a dichotomy in their heads. It’s possible for them to hold ‘he who hesitates is lost’ and ‘look before you leap’ as both being equally valid. In fact, they find that it’s in the dichotomy that there is power – because it’s at these places that truth is more malleable and that understanding can shift reality. So our great Sherlock Holmes is an example of the Sage – continually striving to find what is ‘true’. And perhaps a word of caution here… as I travel through life, and as I learn, the more it seems to me that there is no one single ‘Truth’. Those of us who dogmatically assert ‘this is the only way’ should not be trusted… it is those who have learnt to hold uncertainty in their hands that should be trusted. They are the ones that will point the way for you to discover your truth, not ask you to believe in theirs. If the Wizard singlemindedly looked to Transformation as their goal, the Sage looks for Truth and for Understanding. Knowing that they may never find ‘The Truth’ they still look for models and illustrations by which the world can be understood. In many ways, for example, the ‘truth’ of Newtonian physics has been overtaken by the deeper ‘truth’ of Quantum physics. Newtonian physics still applies for many things – it’s just that it can’t explain everything. Do I think there is something deeper and more ‘true’ than quantum physics? Hell yes. Can I prove it? Nope. But I get the feeling that we really don’t know where the rabbit hole will take us. It takes movement through a whole series of learning stages to ultimately grasp this – we look for truth, believing that there is ‘true’ and ‘false’. We believe that authority is hiding ‘truth’ from us. We believe that it exists ‘out there’ and when we reach a new level of understanding we become fluent proclaimers of ‘the truth’ (I can remember storming arguments with my parents when I discovered the ‘truth’ of Christianity – it is only now that I look back and see the elements where they were wiser than I… and I remember also being dismayed when one of my friends, staunch fundamentalist Christian that she was, declared that she had moved beyond Christianity and embraced Wicca. Right now, I understand what she meant.. that the absolute truth of our fundamentalist beliefs demands a challenge based on what we intrinsically ‘know’ to be true inside. Our feelings are a better guide to what is true and what is not than we dare to believe… but we would do better to trust that sense of right and wrong rather than slavishly following someone else’s ‘truth’. So what does the Sage fear most? Deception, of course. Whether that is our Sherlock being duped by Moriarty, or the Jedi in ‘Star Wars’ being deceived by Ambassador Palpatine – we fear that we are being led down the garden path. Sometimes, of course, this is the only path to wisdom. We have to learn what is not true in order to understand what is. It has taken me many years within a Christian framework to decide what I do hold to be true about that model – and what I fundamentally disagree with. When deceived we become wiser… but it would be better not to be deceived at all. As well as the stories that tell of deception (Gandalf being deceived by Saruman the White in ‘Lord of the Rings’ (he must be a good guy – he wears white)), or Gerda being duped by the Ice Queen, we also have those that speak of being deceived by illusion. Red Riding Hood initially fell for the illusion of the wolf impersonating her grandmother – the familiarity of expectations allowing the illusion to last way beyond when sanity would have noticed the lupine features of ‘granny’. Edmund is deceived by Jadis the White Witch in the tales of Narnia. Often falsehood disguises itself as truth and places itself above challenge – it is the child who sees beyond ‘The Emperor’s New Clothes’ and declares the truth. We fear these things rightly, as illusion and deception go to the heart of our wisdom – and yet, it seems to me, by examining our hearts and understanding how we ‘feel’ about these things, we can better find truth. Our feelings are better guides than we imagine, and are truer signposts to discovering our own truth. So, confronted with a challenge, what will the Sage do? When faced with a dragon, what will the initial reaction of ‘the wise one’ be? Fairly unsurprisingly, the Sage is going to be curious – seeking to understand the problem – to study it, to look for how it can be used and exploited, how the problem or the danger can be transcended. Hmm. Fire breathing monster? Hmmm. Useful for heating villages or defrosting ice bound castles. Problem solved. Of course, sometimes we also need the wisdom to act – to know when studying has done enough, and when we need to make a decision. Our Sages can sometimes get caught up in ‘what if’ when our Warrior beings dispatch the threat with a single sword to the heart. Sometimes we need to trust the wisdom of our response, rather than examining it from all angles first. Again, our hearts can provide a truer and more instinctive wisdom. Simple cerebral knowledge is not enough – we need to feel that wisdom deep inside ourselves, so that our wise response is immediate. As Sages, we are called to understanding. Sometimes that quest will lead us to libraries, to books, to studying. Sometimes it will lead us to wise mentors – or to others around us whose experience we trust. Sometimes it will lead us to action – to learn through doing, from experience – and sometimes, of course, it will lead us to learn through failing. And failure, often, is the best teacher of all. We all know the legend of Edison creating the lightbulb and responding (allegedly while standing in the remains of his laboratory after a particularly spectacular failure) ‘I haven’t failed – I have just found a lot of ways not to do it’. And that’s likely to be the way we learn. Sometimes we can learn from what’s gone before. Sometimes we will instinctively follow our inner leading… and sometimes we will leap feet first into a spectacular ‘learning experience’. (There is a story of a newspaper publisher who, after one of his juniors made a disastrous judgement call and cost the paper several million dollars, decided not to fire the errant reporter, figuring that he had just invested several million dollars in his employee’s education). The Sage has within himself the gift of wisdom – to recognise truth when it appears, even if it comes in a form that is not familiar – or even if the truth is unpalatable, or even rocks his world view. While he may stumble, he will be wise enough to take that new understanding on board. The Sage also comes with a healthy sense of scepticism – new truth will not be automatically accepted and will have to prove itself. The Sage will sift through what he finds – even that which seems to be untrue – looking for the embers of truth that can be fanned into flame – and even so is not afraid to pour cold water on errant ideas (I cannot find out the name of the statesman who, when he was accused of pouring cold water on everything, retorted ‘Cold water, my esteemed friends, is what naturally results when a load of hot air gets on thin ice’. Sometimes our Sage must challenge conventional or trendy thought – a quick poke with a sharp stick can often burst the balloon. Our shadow Sage is not so much the one who has embraced falsehood as the one who has shut himself away from others. ‘Ivory tower’ thinking or building themselves up beyond where they can be corrected – isolating themselves from other thinkers, or being critical of other traditions or thought processes. The Hawai’ian kahuna have a saying ‘not all wisdom is found in a single school’ and openness to new frames of thought, even when they challenge our own thinking, always lead to stronger and more coherent understanding. They say that curiosity killed the cat – and yet it is curiosity that invites our Sage on the journey. It was curiosity that led Alice to follow the White Rabbit. It was curiosity that led Edmund into Narnia. It was curiosity that led the youthful Luke Skywalker to explore the mysterious message from a princess displayed in R2-D2s hologram – and ultimately led him to discover the power of the Force for himself. We seek to know truth – we find ourselves doubting what we have already knows. It was the sight of an elderly beggar that first prompted Siddhārtha Gautama to set out on the quest that would lead him to the wisdom of the Middle Way and let to his recognition as the Buddha. At some point, we find the stories we have been told to be ultimately dissatisfying. We find ourselves adrift in a sea of confusion and lacking clarity – and so we seek to discover ‘The Truth’ – and our journey has begun. Initially we are convinced that there is ‘The Truth’ to be discovered. This is often where religions find themselves – convinced there is ‘one way to heaven’ and that all who do not follow it will either be damned for all time, or at the very least miss out on the blessings that attend the enlightened. We seek to be objective, to stand dispassionately outside our truth – and yet that objectivity can yield us to follow any path that seems sufficiently ‘different’. As we progress, confusion sets in – if we remain open, then we become aware of the multiplicity of ‘truth’ and recognise that all truth is relative and that no-one has all the answers. We recognise that truth without grounding can never be valid in our human experience. And that leads us to our own ‘ultimate truth’ – something that satisfies us intellectually and emotionally. Recognising the subjective nature of ‘truth’ we are able to dispense wisdom to others without dogma or regulation – what we have to say is offered without conditions or demands, able to be integrated into the listener’s own belief system to encourage them on their own quest for wisdom. The Sage will always find himself needing to let go of everything that was considered ‘true’ in order to step into the new world. Often he will look back at the old world and attempt to make new wisdom ‘fit’ – but as Jesus pointed out, new wine cannot be put into new wineskins or else the wineskins will burst with the energy of the new… we must remain flexible and open. The Sage finds himself bewildered by the new truth – and ultimately, letting go of the old, steps into the new. It’s time to be honest now – where does your own wisdom lie? If you truly own up to everything that you’ve learned on your journey since you were born… considering that huge resource of wisdom that you’ve gained – what is the gift you bring to others? And if it doesn’t seem easy to find that gift… what do other people tell you you bring? What experiences do you have? What have those experiences brought to you? And if you can’t think of anything – make it up. Because in making it up you will get closer to what’s true than you can imagine. What have all the tough experiences been in your life? What have they taught you? What interests you? What are you curious about? What would you like to find out more about? So… we have encountered Wisdom in the shape of the Ruler: using his wisdom to rule… in the shape of the Wizard: using her wisdom to transform: and the Sage: using his wisdom in the quest for truth… and so underpinning the Ruler and the Wizard and allowing theme to function from a basis of Truth. Next time, we’ll discover the energy of the Fool – to look back at life and see how we can laugh at it all. Until then.. have fun, and enjoy the adventure!